Ford Motor Company was at a crossroads, and therefore Lincoln-Mercury Division with it. The buying public seemed to be moving away from mid-priced makes towards compacts. The Edsel debacle had cost $400 million, while Mercury’s sales had kept fairly steady since 1957 (except for the recession year, 1958) and had been in seventh or eighth spot in the sales race (except for 1958, when it slipped to ninth – partly because the new Edsel stole some Mercury sales). Ford had spent millions on developing a new Mercury-only body for 1957, which was built through 1960, but clearly Ford Motor Company could no longer afford that for a car selling in numbers of only 150,000 cars a year when the big Ford was selling over 900,000. The 1961 Mercury Monterey was therefore introduced based upon the Ford body shell, shrinking six inches in wheelbase from the year before. The sharing of body shells just made financial sense, as Ford had shouldered enough losses with Edsel and could stomach no more. Besides, people were moving to smaller cars and the March 1960 introduction of the compact Comet essentially saved Mercury Division’s bacon. The 1961 Mercury Monterey styling was new, with headlights separated a bit and a concave grille somewhat resembling the 1960 cars as well as the very popular Thunderbird-style formal roofline (shared with Ford’s Galaxie line). The cars were distinguished from the Fords enough so that virtually nobody outside of Dearborn realized the cars were now based upon Ford bodyshells. Alas, sales of full-sized cars still plummeted to about 70,000 units, but this was the same general sales malaise in mid-priced large cars seen across the board and was not the fault of the cars themselves. 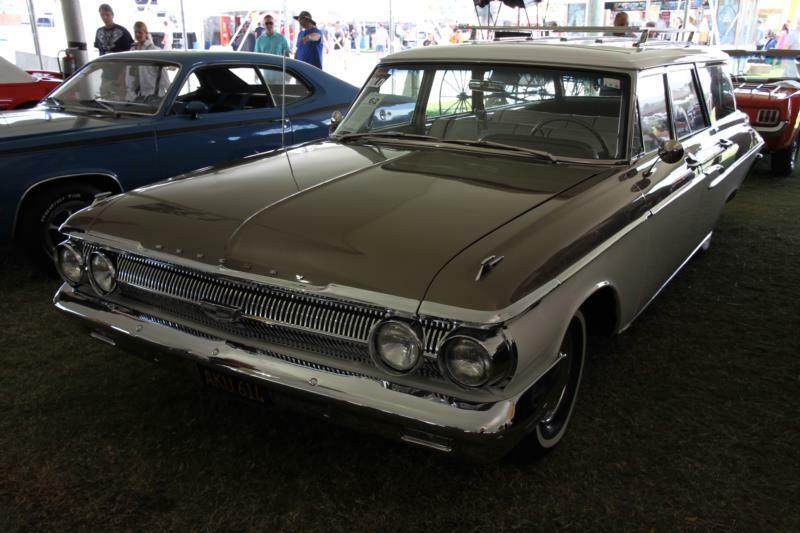 In fact, it doomed Edsel the year before, and doomed Chrysler’s DeSoto brand which finished in 1961. Buyers of the 1961 Mercury Monterey got excellent value for money, because the car was still large, comfortable, powerful and could be ordered with a new FE block 390 cubic inch 300-hp V-8. The standard V-8 was 292 cubic inches with 190 hp, while a 220-hp FE block 352 cubic inch V-8 was optional. The 1962 cars were given a mild facelift, and a new FE block 406 V-8 of 385 hp (and a hotter 330 hp version of the 390 FE block) were made available. A late introduction special order engine was a 405 hp version of the 406 cubic inch V-8. Mercury’s marketing crew had their hand on the pulse of the market and moved quickly to adapt, so just to be on the safe side, they also offered the 223 cubic inch six (for one year only). 1962 sales increased for Mercury, with the Monterey and new Monterey Custom (as well as related station wagons) now selling near 110,000 units with overall Mercury sales increasing from about 317,000 to 341,000 units. The 1963 Mercury Monterey was given completely new skin and rooflines, with unique reverse-slant rear window that had a power window drop and raise facility. This was quite a sales point in an era before air conditioning became common equipment. Monterey sales were about 106,000 units for the year, with overall Mercury sales down some 40,000 units. Clearly, the compacts and all-new mid-sized Meteor were selling less well than just the compact Comets had in 1962. With the Meteor series name now moved to a mid-sized car, the Monterey was demoted to the lowest priced full-sized Mercury. Under the hood, performance started to become a prime concern, and the extremely powerful FE block 427 of 410 hp was offered as an option, with the 406 returning in 385 hp and new 405 hp versions as well. The 390 engine was newly standard with 250 hp, while 300 and 330 hp versions of this FE block also optional. For 1964, the cars carried over with a new front styling and other detail changes, plus the addition of a hot new Marauder subseries made up of fastback hardtop and two-door convertible. Above the Monterey was the return of the upscale Montclair line, and new top-of-the-line Park Lane series.